Most of you know by now that I am a martial artist. I have written enough about Tae Kwon Do over the years that even if you only visit my blog occasionally you are likely to have come across something about TKD. 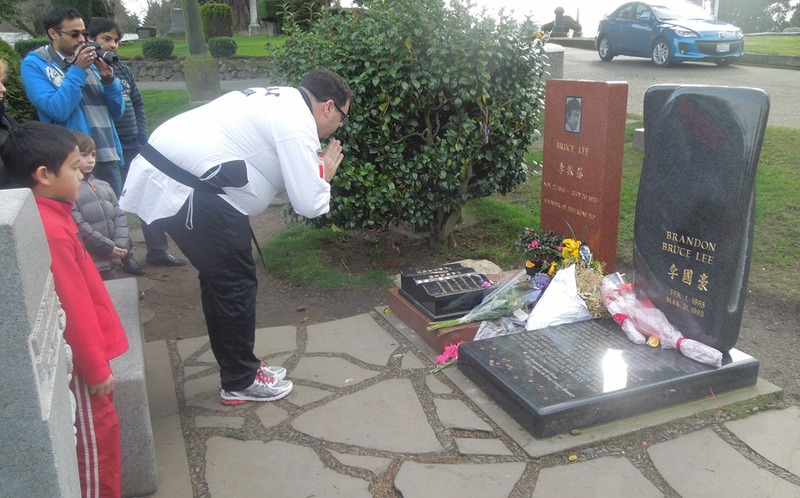 For all of these years that I have been going to Seattle I never realized that Bruce Lee’s grave was there. When I found that out a few months ago I vowed to make it a point of visiting it on my next trip… and I did. Saturday was a cloudy but dry day, and I met a friend for breakfast. I told him about my plans for the afternoon, and he was happy to join me. While not a martial artist himself, he has a great deal of respect for the arts, and like many people of our generation is a fan of Bruce Lee’s movies. So together we looked it up on the map and figured out where we were headed, and after picking up my uniform at my hotel we headed out to the Lakeview Cemetery, a few miles north of downtown. As we pulled into the cemetery we realized that it was too big to just look aimlessly, so we asked a couple of people if they knew where it was. ‘Over that way… just look for the crowd of people – you won’t be the only ones today!’ So we followed the directions, and sure enough there was a crowd there. We got out of the car, I handed Jared my camera and donned my uniform. I tied my Black Belt with the solemnity that such an occasion deserves, and straightened my uniform before walking over. There were several people there milling about, taking pictures, and talking about their favorite Bruce Lee movie, move, or whatever. Some of the visitors were Caucasian, some Asian, and a few African and Middle-Eastern; it depended on the minute, because most of them came, saw, took a picture, and left. That was not what I had in mind. I have been to many solemn places throughout my travels, and I can honestly say that this was among those that touched me the most. I do not know if it is because of my love of martial arts and Bruce Lee’s contributions to them, or the fact that it was his movies that first got me excited about martial arts (as well as my fascination with nunchuks) when I was hardly ten years old. I do know that I was moved just being there… and the fact that his son Brandon is buried next to him sent shivers down my spine. Visitors came and went, but I was not there for a photo op or ‘to say that I had done it.’ Frankly I was not really sure what I was going to do when I got there… I only knew that it was something that I had to do – a pilgrimage if you like. I suppose a lot of people go to a lot of places ‘not knowing’ and figure it out when they get there. The first thing I did when I walked over was exactly what I do when I face my GrandMaster in a class; I got onto my knees, put my hands to my head, and bowed down. In many Oriental cultures bowing is a show of respect, and the lower you bow the more respect you show. Bruce Lee deserves as much respect as anyone in the martial arts – dead or alive. 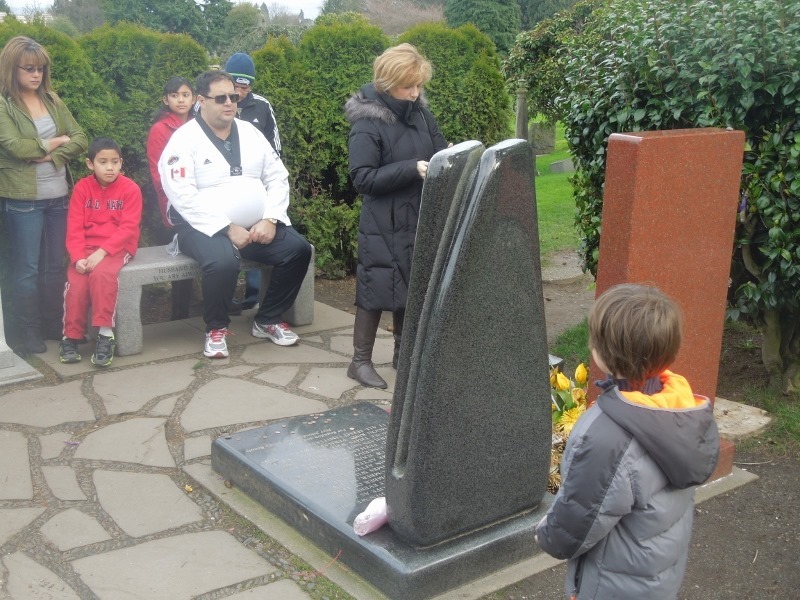 I was the only person in a dobok (Tae Kwon Do uniform) – or any other martial arts uniform for that matter – and the people there seemed to understand that I was not only there as a tourist, but to pay my respects. They made place for me, and as I got to my knees to bow all of the chatter stopped. Maybe it was simply that I tuned it all out, but I heard the birds chirping, I heard the leaves on the nearby trees moving with the wind – I heard and felt the world at peace. This is the state that we try to achieve when we meditate before our classes, and how it should be when experiencing a private moment alone while you are surrounded by people. When I said I did not know what I was going to do when I got there I am not kidding, but when I was there I had so many things that I wanted to do… I bowed several times, I tied my belt around his headstone hoping that his wisdom and ability might be mystically transferred to me, and in keeping with my roots I left a stone on both his and Brandon’s graves as a reminder that I was there. While most people leave flowers, the Jewish custom is to leave a stone, because flowers wilt but the stone never does. 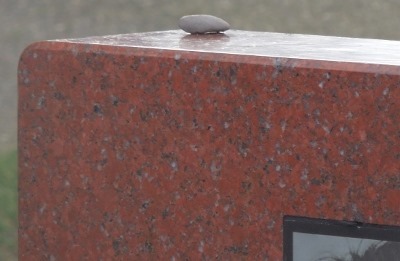 I was surprised later, when I was checking the pictures that Jared had taken, that he took a picture of these stones. I was glad for that, because I likely would not have remembered. However I think knowing Bruce Lee’s teachings he would appreciate the stone – he taught us about the different components of rocks and water, and how two rocks might collide, but the flowing water can move and shape mountains, so we should be like water. I looked around for several minutes until I found the most perfect stone that I could find, and I cleaned it off before leaving it for him. Empty your mind. Become formless and shapeless like water. When water is poured into a cup, it becomes the cup. When water is poured into a teapot, it becomes the teapot. Be water, my friend. As I said there was a nearly constant flow of people, but I was thrilled that for several minutes I was able to be alone with my thoughts. 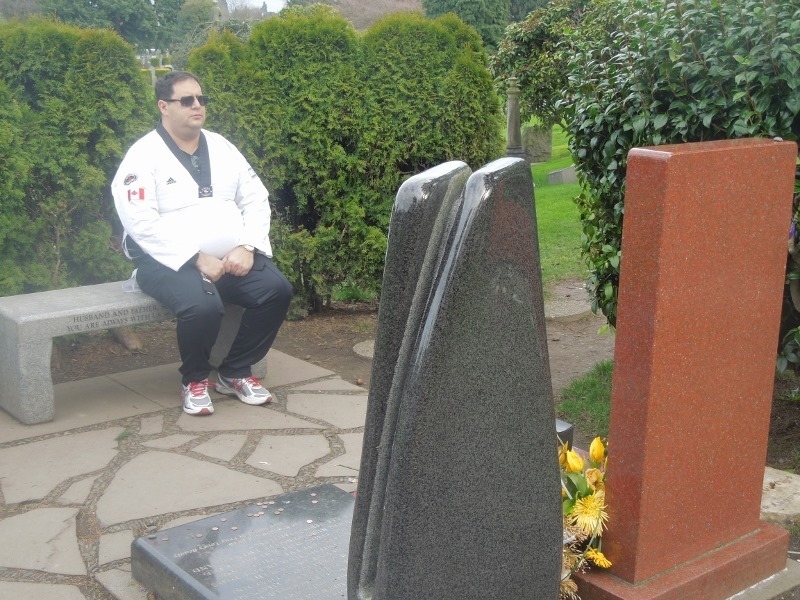 I sat on the bench that faces the graves, I put my hands in my lap, and I guess I had a conversation with Bruce Lee. 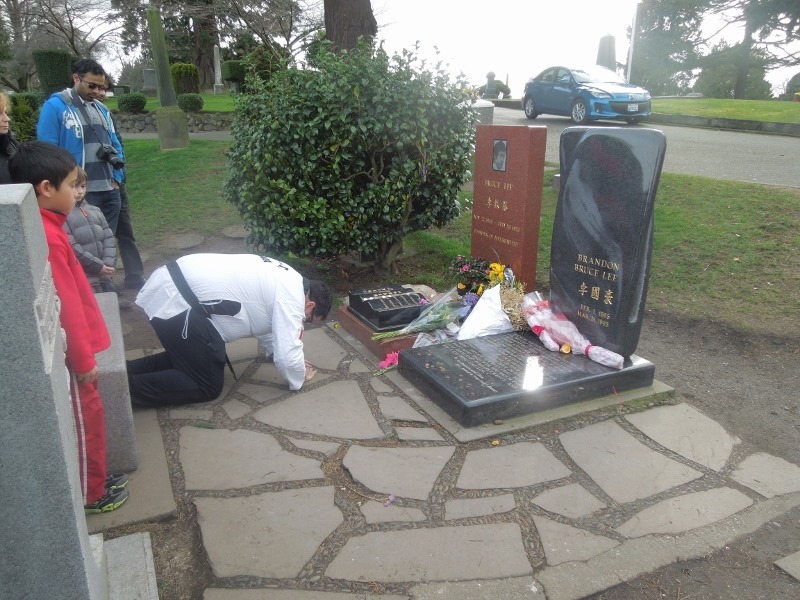 I thanked him for his contributions to the martial arts – while he was not alone, he was among the first oriental instructors who agreed to teach martial arts to guay-loh (non-Chinese). Without his push many Westerners who have studied and practiced and fallen in love with the beauty of Chinese and Oriental culture over the past fifty years probably would not have had the opportunity to do so. As I sat there with my Black Belt I meditated on that thought, and wondered what I would have done in a western world bereft of martial arts. Even if the credit for that were to go to someone else, I was never inspired by David Carradine. After Bruce Lee there was Sho Kosugi, and later Jackie Chan… but it was Bruce Lee who started it all for us… it was he who introduced the western world to the beauty of Kung Fu. I do not know how long I sat there, but the pictures show that many people came and went as I had my conversation (in my mind) with The Dragon. I asked him for wisdom, and while that may sound silly, in preparing this piece I stumbled across a page of his quotes, and feel that I am wiser for having read them. They also reminded me that no matter how great we may get, the ultimate goal must always be humility. We cannot do what we do for grandeur, only for self-awareness and self-improvement. “I am not in this world to live up to your expectations and you are not in this world to live up to mine.’ ‘You know what I want to think of myself? As a human being.’ ‘The word “star” is an illusion… it’s something that the public calls you. You should look upon oneself as an actor.’ All of these and a hundred more remind me that the greatest icon in the history of martial arts movies was the humblest of men, aspiring only to live, to share life’s beauty. He was a teacher, an innovator, and an incredible influence on untold thousands like myself who likely never would have enrolled in a karate class had it not been for him. Bruce Lee was taken from us far too soon – he died on July 20th, 1973 – two weeks after my first birthday. He was a few months shy of his 33rd birthday, and yet look at the impression he left on so many of us… on the world, really. dozens of good and thousands of bad martial arts movies all stemmed from his movies – they were big in the Orient before him, but he introduced the world to Kung Fu – and the martial arts. His son Brandon Bruce Lee also died at a very young age – he was twenty-eight when an accident on the set of the movie The Crow took him from us. 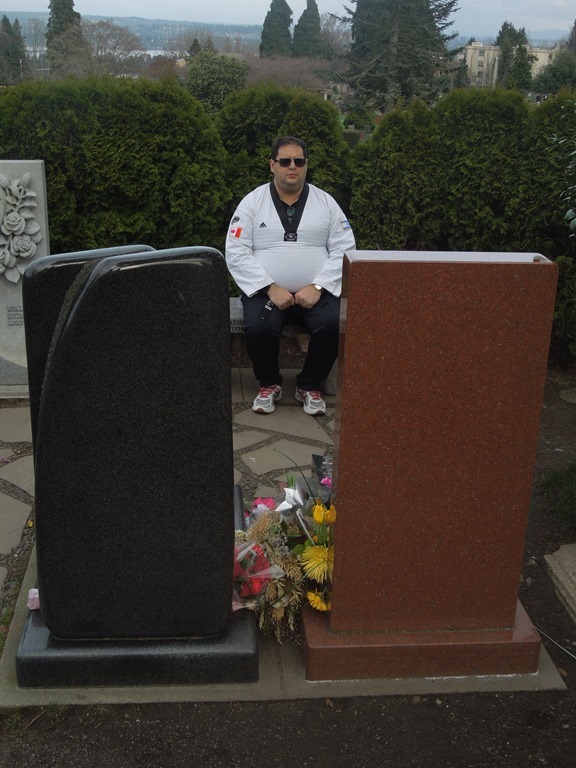 It is a sad legacy… but he is still survived by Shannon Lee, his daughter. Everyone knows the name Bruce Lee, and his face adorns posters and t-shirts all over the world, nearly forty years after his death. Had he not died of a brain edema in 1973 he would be seventy-two years old today; like many of the greats who died too soon during that period (Jimi Hendrix, Janis Joplin, Jim Morrison, etc…) his contributions to culture would be impossible for most people who lived three times as long… we will remember him forever. Mitch – It was my pleasure to hang out that day and head over. 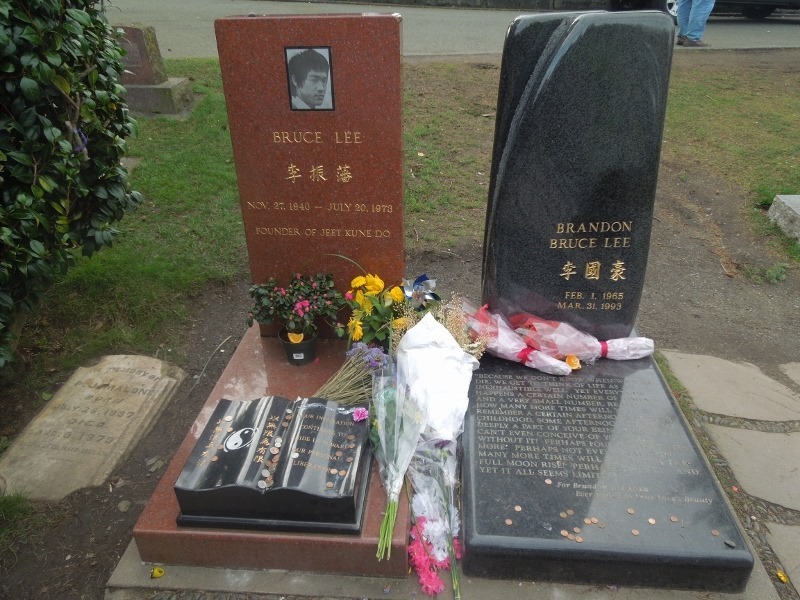 Even being a Seattle-native, I didn’t know that Bruce or Brandon Lee was laid to rest here. It was definitely a moving experience to go with you and observe. Thanks for sharing. It reminds us all of a few things, there were great people that helped shape today and should never be forgotten and most importantly we should all be willing to step up and be ourselves. It inspires others to be more than they ever were. trained in different Martial arts now for well above twenty years. noticed happens to be the respect and discipline which has changed those peoples perception of life. discipline and fighting and they soon start to understand. of their aggression without hurting or bullying anyone.